After a few days out of town, it is SO good to be back home, and in my kitchen! And first thing on the menu is this incredible Lemon Chicken Recipe I had saved in my “Recipes to Veganize” Folder on Pinterest. Every now and again I’ll see a SAD recipe that makes me stop and pay attention. THIS recipe from 12 Tomatoes was one of those recipes. Their video made it look SO good I knew I would modify it sooner or later. Thick enough to be a meal all by itself, but thin enough to pour over a freshly baked potato or a steaming bowl of brown rice too. Now THIS is the kind of comfort food a guy can get used to! In a large soup pan, add about 1 cup of chopped celery (2 stalks), 1 cup of chopped carrots, and 1½ cups of chopped onion (or leeks). For those of you would-be food nerds – the French call this a Mirepoix. Sauté the veggies in about ¼ cup of veggie broth until softened – about 5 to 10 minutes. Now add in an 8oz package of Mushroom and simmer until they too are softened and lose their liquid. Add in about 3 cloves of freshly minced garlic and stir for about a minute until aromatic, then add 6 cups of low-sodium Vegetable Broth, 2 Bay Leaves, a teaspoon of Dried Thyme, and ¼ tsp of Garlic Powder. Bring this to a boil and then add 1 cubed, Yukon Gold Potato, and ½ cup of uncooked wild rice. In a separate bowl or measuring cup, whisk 4 Tbls of Corn Starch with ½ cup of unsweetened Almond Milk to make a slurry, then slowly stir this into the soup, stirring often as it gradually thickens. Reduce the heat and add your Soy Curls now, and let that simmer for about 20 minutes. No need to rehydrate the Soy Curls – just dump them in dry. (Affiliate Link to Amazon Here) Note: When you purchase something through my Affiliate Links, I receive a commission that helps support this site at no extra cost to you. Finally – add ¼ cup of Lemon Juice, and 2 tsp of Lemon zest. To zest a Lemon, use a grater to scrape off the yellow part of the peel. This is the zest. Do not get down into the white pithy part as it is usually very bitter. Taste for seasoning – I added about ½ tsp each of both Black Pepper and Salt. Adjust to your own individual taste. Garnish with a teaspoon or two of chopped chives and slices of freshly cut lemon. 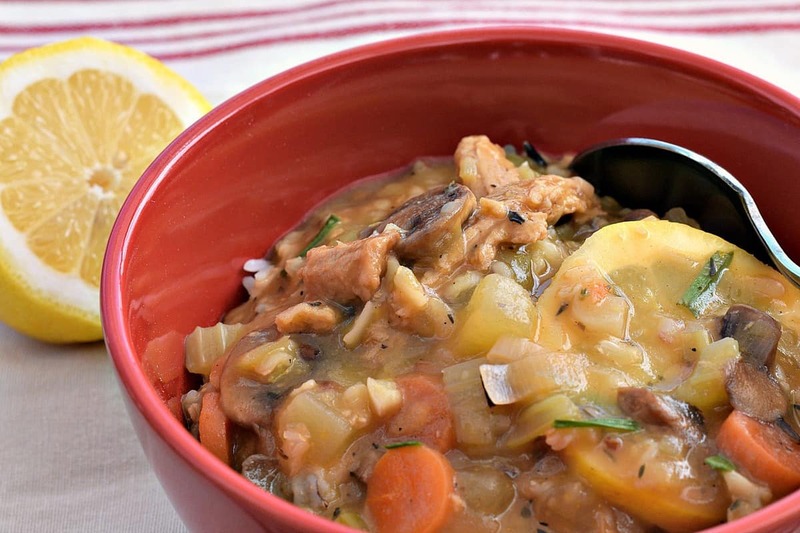 This healthier version of the popular Lemon Chicken recipe is a savory mixture of Butler Soy Curls, Mushrooms, and Wild Rice in a thick lemony broth. Perfect as a bowl of soup or for pouring over a baked potato or rice. Made this last night and it was quite good. I ended up just juicing the same lemon I used for zest and then tossing the remainder of the lemon in the pot to cook to add even more flavor. I served this over white rice (kids eat it without the rice…but I like having more starch). Thanks! Keep the recipes coming.